10. Who Defeated the Somali Pirates? As the title suggests, the article explores the various factors that led to the precipitous fall in piracy off the Horn of Africa. Humorously, the article was pirated and reprinted without attribution by an online Somali newspaper, The Somaliland Sun. This piece envisions a hypothetical future-war scenario, based on current tech trends and capabilities, using naval drones and cyber attack to achieve tactical surprise against the dastardly nation of Orangelandia. We got a re-tweet from Pete W. Singer, author of Wired for War, which I am now making my way through. Written by our esteemed colleague and contributor in Poland, Przemek Krajewski, this post covered the historic role and future of Poland’s Navy, and received a good deal of attention from industry analysts and those curious about the state and pace of Polish naval modernization. One of the many top-10 articles from our popular International Maritime Satire Week (4 come from that week). When the choice is between hard-hitting analysis and satire, the people have clearly spoken. Good thing we don’t rely on ad revenues! LT Chris Peters had the honor of taking the conn when the USS Constitution went underway under sail in Boston Harbor this summer for only the second time in 131 years. 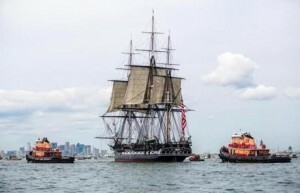 Here he describes an experience aboard Old Ironsides he’ll never forget. There will be no Sequestration, at least for another two months, but if it does come to cuts, here’s how the Navy will pay the bills…in the world of satire. From our partners at the Atlantic Council of Canada comes an examination of the vulnerability of economic chokepoints to maritime terrorism. Sadly not part of International Maritime Satire Week. This article ponders a world in which Sailors are not only told what not to do, but in which ‘speed traps’ are laid to catch the unwary. Pure satire, right? 2. An Influence Squadron in the Making? Kurt’s post explores alternate configurations of platforms for naval squadrons – using amphibs and small craft to their best effect. Far and away the most popular article of the past year was the fictional preview of the upcoming season of “Deadliest Catch.” Bonus: Check out the comments section to see what one of the producers of the show, Todd Stanley, thought of the piece.